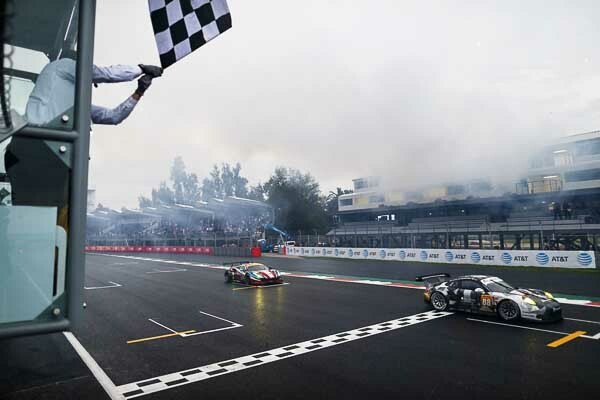 Great success for Porsche customer teams at the premiere of the WEC Sports Car World Endurance Championship in Mexico: With the Porsche 911 RSR, Abu Dhabi Proton Racing won the GTE-Am class at the Autódromo Hermanos Rodríguez circuit with the team celebrating its maiden WEC victory in front of 38.000 spectators. Sharing driving duties in the cockpit of the 470 hp winning racer from Weissach was Porsche’s works driver Patrick Long (USA) with Khaled Al Qubaisi (Abu Dhabi) and David Heinemeier Hansson (Denmark). The KCMG squad with Porsche factory pilot Wolf Henzler (Germany), Christian Ried (Germany) and Joel Camathias (Switzerland) secured the third podium spot after a gripping six-hour race. Gulf Racing rounded off the sterling performances from Porsche customer teams with the all-British line-up of Ben Barker, Michael Wainwright and Adam Carroll clinching fourth place. In the GTE-Pro class the situation was looking promising for third place for the Porsche works drivers Richard Lietz and Michael Christensen in Dempsey Proton Racing’s 911 RSR, but as rain set in about halfway through the race on the Mexico City Grand Prix circuit at a 2,310-metre altitude, they dropped down the field after making an unfortunate tyre choice. The pair took the flag in sixth place. Richard Lietz (Porsche 911 RSR #77): “My first stint was good with consistent lap times. The balance of our 911 RSR was great and we were fast. Before my second stint it started to rain and we had to make a difficult decision regarding the tyres. With the benefit of hindsight, it would definitely have been better to opt for wets and then change to new slicks. However, we decided to stick with the used Michelin rubber and this unfortunately proved to be the wrong decision. Round six of the Sports Car World Endurance Championship WEC will be contested in Austin/USA on 17 September.